Welcome to 2018! I find the beginning of the year so inspiring. We have a fresh start and so many possibilities before us. From Andrea: Happy New Year! I live in Florida, where we have plenty of gorgeous plants flourishing all year round, but I know that in some parts of the world the plants have lost their leaves and colors . . . well, except for the conifers! Aren’t evergreens and conifer trees beautiful symbols? They show us how to be vibrant and joyful even if the weather is cold, the days are short, and most of the other plants are “hibernating!” Conifers have another kind of support to offer us, too . . . the conifer essential oils are excellent at supporting immunity! They’re useful for clearing congestion, boosting vitality, and helping us stay vibrant and healthy. I included a few recipes with conifer essential oils in this newsletter for you. Conifers also have strong, fresh aromas. It can be so sweet to fill your home with the scent of evergreen! 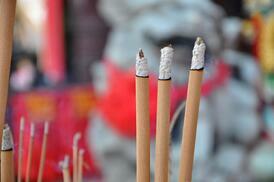 So I included a loose incense recipe for you, too. Speaking of incense . . . I have a fun “Our Aromatherapy World” section below! My friend Evan Sylliaasen is an incredible person—innovative, imaginative, and knowledgeable—and he runs the Northwest School of Aromatic Medicine. 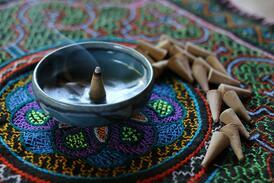 He also runs Higher Mind Incense, and teaches in-depth courses on making and using incense. I’ll tell you more about it below! Make your incense in a beautiful bowl that you’d like to display it in, or use a container for leftovers that has a lid. All you have to do is put the copal resin into your bowl, then drop the essential oils right onto the resin. Use a spoon to stir the blend together and help the essential oils distribute more. Then allow your blend to dry for two days before burning it. You can see how to burn loose incense in this YouTube video I made. 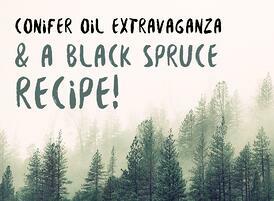 On the Aromahead Blog: Conifer Oil Extravaganza and a Black Spruce Recipe! Conifer essential oils are distilled from evergreen trees—from the needles, and in some cases from the cones, twigs, and wood. They flourish even in very cold weather, and they can help us to do the same. Conifer essential oils offer such wonderful benefits to the respiratory system, warding off colds and flu. If you do come down with a bug, they can help you recover more quickly, easing congestion and sore muscles. Conifer oils are also amazing cleaning agents. You can diffuse them to reduce airborne microbes (imagine that clean pure mountain air! ), or create natural cleaning products that reduce germs on your surfaces (and in the air at the same time). I promised I’d tell you more about my friend Evan’s school Higher Mind Incense! I asked him to describe his course for you, and he gave such a thoughtful reply that I wanted to share with you. I have some great news . . . Evan is offering 20% off the course for the Aromahead community! If you use this link to register for his course, you will receive the discount. Be sure to register soon if you want to learn about incense, because this discount is only good until January 22nd, 2018! Balsam Fir is a wonderful choice for respiratory support, achy muscles and joints, and getting your energy flowing in a positive way. The aroma of Balsam Fir reminds me of being in a snowy evergreen forest on my way to a holiday party. I’m so cold . . . but so happy to be going to see friends! Its fresh, evergreen, almost sparkling aroma brings out confidence and warmth, making people feel comfortable with expressing themselves, and even easing tightness in the body that might hold you back or make you feel nervous. 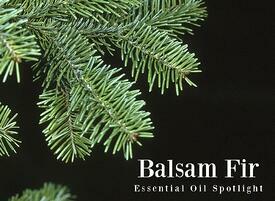 Read more and have fun with the four Balsam Fir recipes in this Spotlight! Business Tip: Facebook's "See First"
I want to tell you about a tip that can help you reach more of your followers on Facebook. Did you know that not all of your Facebook followers will see everything you share? So much can show up on their “news feed” that they might miss your posts altogether. Fortunately, there’s a way to guide your followers on how to see more of your posts so you can create a stronger community on Facebook. I’ll walk you through the process by demonstrating with Aromahead! First, go to Aromahead’s Facebook page. Under our colorful banner at the top of our page, you’ll see buttons allowing you to “Like,” “Follow,” and “Share.” If you already “Like” our page, then hover over the button that says “Following.” A list of options will appear in a drop-down menu. One of the options is “See First.” Click that. What will choosing “See First” do? It means our posts move to the top of your newsfeed on Facebook! You’ll be much more likely to see what we share....and if you tell your own Facebook community about this, they’ll be more likely to see your posts, too! You can even copy and paste the 3 steps I gave you above and share them with your Facebook audience. (Be sure to fill in your own Facebook information instead of using Aromahead’s for Step 1!) I suggest posting this periodically. If some people aren’t currently seeing your posts, they might miss this update! So it helps to share it more than once. 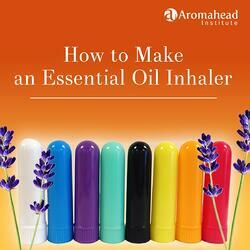 This video is about how to make an Aromatherapy inhaler. It’s simple! You can make an Aromatherapy inhaler for all sorts of issues, like cold and flu (and other respiratory conditions), preventing illness and boosting immunity, healthy traveling, headache relief, muscle tension, sleep . . . the list could go on and on! When you make an Aromatherapy inhaler, you need a small bowl, tweezers, and the essential oils you’re using. Just remember, you want about 15 drops total of essential oil in the inhaler. This particular recipe includes Balsam Fir, Black Spruce, and Mandarin. I hope your year is full of love, happiness, and essential oils!